Peterborough Youth Choir, Broadway Theatre, Peterborough. Picture by Terry Harris. Led by award-winning choral conductor Will Prideaux it will also feature the Peterborough Youth Choir “lads” and members of the nationally renowned Peterborough Male Voice Choir. The event will take place at the Broadway Theatre, home to the city’s unique music education charity Peterborough Sings! which works weekly with over 250 members in Peterborough Male Voice Choir, Peterborough Voices and Peterborough Youth Choir as well as with hundreds of local schoolchildren through its outreach programmes. As Director of Peterborough Sings!, Will Prideaux is leading the Arts Council England-funded Sing! initiative for Peterborough Music Partnership which aims to improve provision for singing in the city’s schools and which, to date, has engaged some 3,000 local children in “big sing” events at the KingsGate Auditorium and the Broadway Theatre. Nationally recognised as an expert in the male voice genre, Will Prideaux is working with considerable success to develop boys’ choirs at local schools including Thorpe Primary, Longthorpe Primary and the Ken Stimpson Community School. Boys from all three schools recently performed alongside Peterborough Youth Choir at the sell-out Christmas Magic concert at the Broadway Theatre. Will has a proven track record of getting and keeping boys singing and of working with boys with changing voices. “Boys voices don’t break, they change,” he says “and it is crucial they understand what is happening to them”. Several Peterborough Youth Choir boys have successfully auditioned for the National Youth Choirs of Great Britain and others – the youngest just 16! 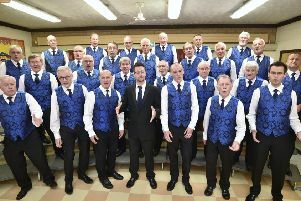 – have recently made the transition to Peterborough Male Voice Choir. The Peterborough Youth Choir “lads” will for the first time this year compete as Peterborough Boys’ Choir at the prestigious Cornwall International Male Voice Choral Festival in May. The Boys’ Singing Day is for boys age 7+ and will be at the Broadway Theatre on Saturday, January 24 from 10am-4pm.